NRI Politicians- Raj Pannu of Alberta is the oldest MLA in Canada! 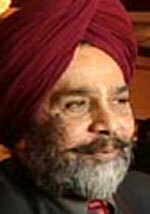 Amarjit Grewal, 61, has worked and lived in the Edmonton-Millwoods-Beaumont constituency for over thirty-five years. Mr. Grewal is an Edmonton City DATS driver and was a leading negotiator for the Alberta Taxi Commission from 1992-1997. He is also an entrepreneur and owns a successful small business within the riding. A Liberal Party activist, Mr. Grewal has served as the Northern Alberta Multiculturalism Chair and has worked hard to ensure that the democratic rights and policies of Albertas multicultural communities are represented. This election, Amarjit wishes to emphasize three key areas of Liberal policy that he sees as important for the Edmonton-Mill Woods-Beaumont riding. First, he will work hard to promote family reunification immigration policies and to ensure that the Liberal government increases foreign credentials recognition for all newcomers to Canada. Secondly he will focus on developing new affordable housing initiatives so that all Albertans can enjoy the benefits of their own hard work. Finally, he will promote public safety and crime prevention programs that will ensure that all citizens in his community can feel safe. - Abuse in NRI families- spouse, children, seniors; property or other problems in India?